Why did I start growing masdevallias? As a junior grower, I was constrained by many factors, not least the size of my plants. Even though I was allowed to put my plants among my parents’ collection and eventually be allocated my own space, I still had to be mindful of how much room I was using, especially in the heated igloo, which my parents were always complaining was too crowded. Masdevallias seemed to be the perfect solution as mature plants can fit comfortably in quite small pots. Their flowers come in such a wide range of colours, sizes and shapes that they seemed to me to be the perfect orchid. 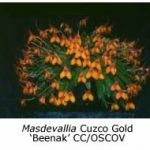 There are 300-400 different masdevallia species and many more in allied genera, so there are plenty to choose from. As a junior I found it a highly rewarding genus – there is almost always one or another in flower, and each month I could count on something different to exhibit on the show bench. Habitat. 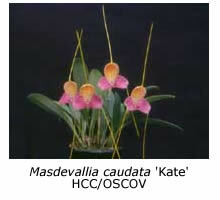 Masdevallias are native to the central and South American continent. 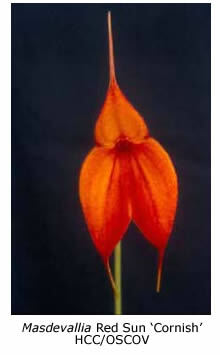 Masdevallia floribunda is the most northerly species, being found in the mountains of Mexico. Most grow in the equatorial regions of central and South America, usually in the mountains. They enjoy a temperate climate with little seasonal change. Culture. Most masdevallias prefer an intermediate environment with a minimum temperature of 10-12˚C. Our igloo has a warm end and a cooler end, and our plants are placed in it according to their preference. 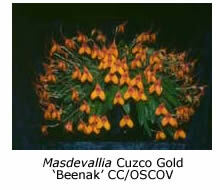 Dracula species and hybrids prefer warmer conditions, while other more robust masdevallia species prefer it cooler. 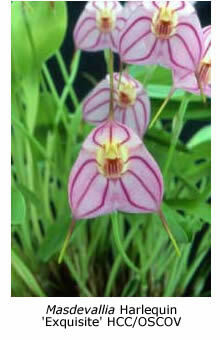 Some masdevallias, such as the awarded Masdevallia veitchiana ‘Sol’, prefer to grow outdoors with the cymbidiums. Heat is a killer for masdevallias, so provide extra protection on hot summer days by keeping them in as humid an environment as possible and by providing plenty of air movement. If you can afford the cost, buy an evaporative cooler for your growing area. Potting. Most of my plants are grown in chopped Sphagnum moss mixed with small polystyrene chips, which stop the mix from becoming waterlogged. Some growers use other materials, such as Versa Rock and pine bark or Rockwool, Perlite and polystyrene chips. If you use bark in your mix, it’s a good idea to add some Canunda shell or granite chips to minimise the development of acidity as the bark ages, especially if you fertilise heavily. Basket pots should be used for those plants that need to dry out more quickly than others, or those (such as draculas) that send their flower spikes down through the mix. Some plants are more conducive to mounting than potting. If you have a large plant that needs dividing, try growing the pieces in different ways (eg. in a hanging basket, on a mount, or in a pot) to find out which method suits best. Watering. I water my plants once each week at this time of year (September) but by summer they are watered every day. 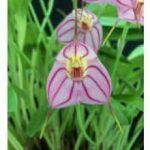 Water and humidity go hand in hand, and the key to a happy masdevallia is humidity. 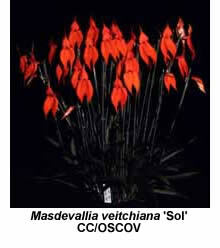 Masdevallias do not have pseudo-bulbs and rely entirely on their leaves for nourishment and water uptake. A humid environment is essential, especially as keeping the roots too wet can cause them to rot. Humidity. The higher in the greenhouse, the greater the humidity of the environment. Hot air rises, and the higher the temperature, the more moisture the air can absorb. 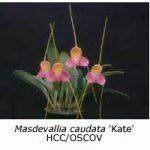 There is a two-fold advantage in hanging your masdevallias high, as we have found that our plants now flower more prolifically, due to the combination of higher light and humidity levels. Plants with light green leaves will produce twice as many flowers as those with darker green leaves grown in heavier shade. Air movement is a critical factor, as masdevallias require good air movement all year round. We use electric fans all year, and when the weather becomes warmer, even in spring, we use an evaporative cooler to keep the plants in their comfort zone. Fertilising. Plants like to be fertilised but only at low concentrations. Peter’s fertiliser, applied at one quarter of the manufacturer’s recommendation, seems to be the correct strength for our masdevallias. Pests and Diseases. Slugs and snails are our greatest problem. Snail bait works well (beware: it can also kill dogs and other pets) and so too does the heel of your boot! Caterpillars are currently a problem, as they chew the young flower spikes. I try to catch them in the act and remove them from the scene of the crime but you may prefer to use an insecticide. Virus. There is only one known virus that infects masdevallias, namely, the yellow bean virus. If you suspect that your plant is infected, remove it from your collection and seek expert advice. If the infection is confirmed, destroy the plant as the infection could spread throughout your whole collection. Yes, it hurts to destroy cherished plants but it’s better than eventually throwing out your whole collection. Starting Out. 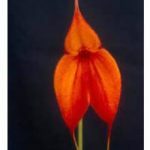 Masdevallia veitchiana and its hybrids are the best plants to begin a masdevallia collection. They are robust plants that provide large flowers of good substance in orange or sunset tones. Don’t be afraid to try masdevallias – they really are very rewarding orchids to add to your collection. Good Luck!